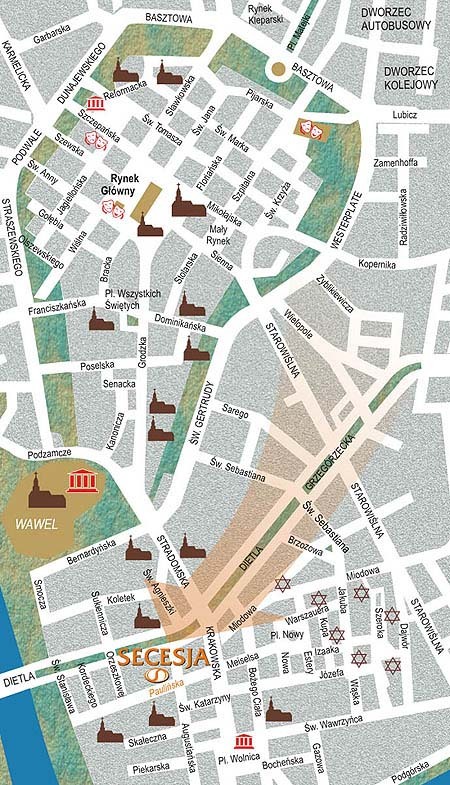 We will be delighted to host you in the recently open Secesja Hotel, which is located in the old Jewish district of Kazimierz close to the Wawel Royal castle. We offer 50 sleeping spaces. All of our rooms are air-conditioned equipped with bathroom, radio, telephone, TV-Sat and mini bar. Our hotel also offers:air-conditioned restaurant with polish and international cuisine, Aperitif Bar, Sauna and Fitness. There is a car park for the guests. Our hotel offers a conference room for 60 people. We organize banquets and family meetings. Our additional services include excursions to and outside the city, site events such as baking of the calf, grill, etc. Special rates, highly qualified staff, a domestic climate and a top location only a few minutes walk to the town centre makes hotel Secesja the perfect place to stay in Cracow. The hotel is situated 500 m away from the city center, 1 km away from the main train and bus station). The nearest airport is located about 11 km away from the hotel. From the railway station: we reach the hotel by tram no 10, getting off by Krakowska street. From the airport: by bus no 152 - by Staszewskiego Street we change to the tram no 8 and we reach Krakowska street.